The BIOS is the central nervous system of the computer - it decides where signals between all the different components should go (in this analogy, the CPU is the muscles, the RAM is the brain, the GPU is the visual cortex, I have no idea what the liver or gall bladder would be...). It is a very important part of the whole package, so the BIOS must be coded properly and loved by the manufacturer. It should be simple enough to make it easy for users but also offer the level of complexity that enthusiasts would want. 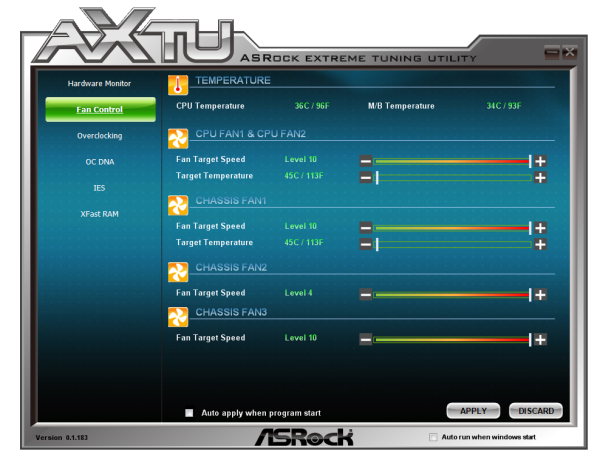 We briefly tackled ASRock's BIOS when we looked at the Z77 Extreme4 - in comparison, there are a few nuances with the Z77 Extreme6 that I should mention here. My normal BIOS policy when getting a board in for review comes in two forms. If I received the motherboard before release, when it comes around to reviewing I will update to the latest publicly available BIOS at the time; if I receive the board after the chipset has some footing in the market, I will review it as-it-comes. My sample from ASRock was on a very early 1.01 beta BIOS, so I upgraded it to 1.70. This version comes with some extra features (Internet Flash, Dehumidifier) which I will mention later. The original BIOS, should you have it, it worth updating - the early revisions were slightly unstable and would hang from time to time. Neither BIOS was entirely happy with my memory choice - my kit for Ivy Bridge reviews is a G.Skill 16GB DDR3-2400 9-11-11 kit (F3-19200CL9Q-16GBZMD), which works in most Z77 motherboards without an issue. With a few motherboards, I have to raise VTT from automatic to 1.3 volts. I had to do that with the Z77 Extreme6, but even then the system would fail to boot or BSOD every now and again. All the testing was complete at XMP for this kit, albeit in batches when it was working. 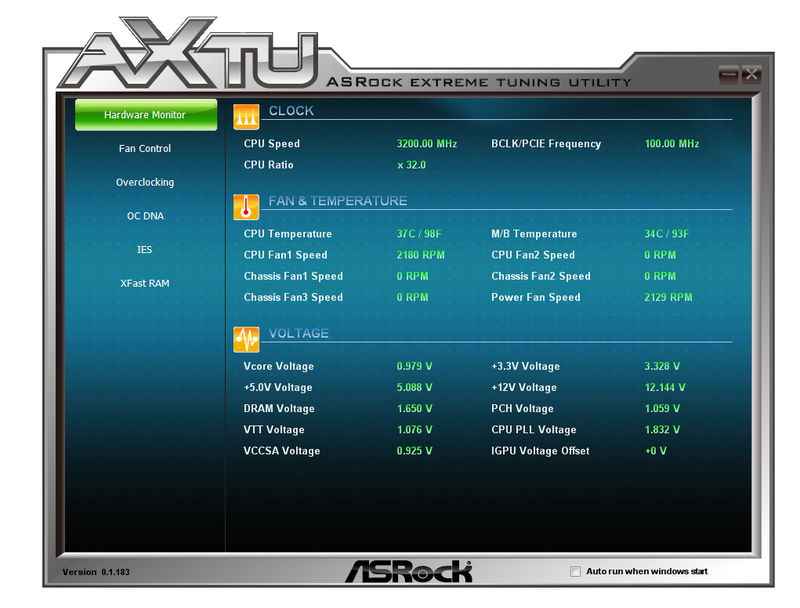 The BIOS itself in terms of features is a packed as the Z77 Extreme4. Our front screen gives us a lot of information that we like to see from a BIOS - the motherboard being used and the BIOS version; the CPU and CPU speed; the total memory on board, as well as a break down per memory stick and current speed of those modules. All we are really missing is some form of persistent temperature value present on the screen, and perhaps some voltage readings. 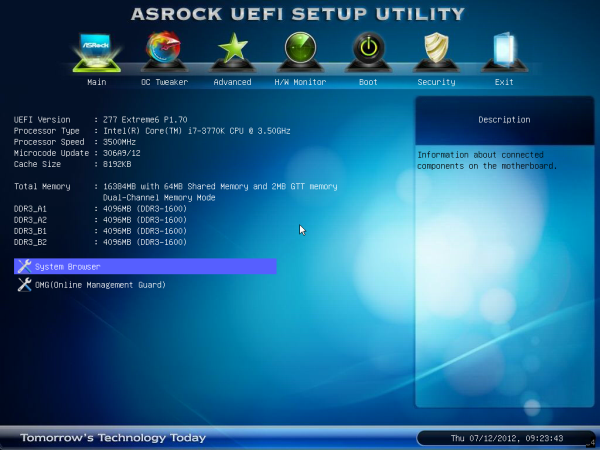 On this front screen are two additional features that do not really fit into the rest of the BIOS. The first is the system browser, which is a top down image of the board installed with all the components inside it identifiable. This is handy if some hardware is not being seen - if it is not here in the system browser then chances are the operating system will not initialize it (i.e. a memory stick or 2nd GPU dies). The other feature on the main screen is the Online Management Guard, or 'OMG'. The premise of this comes down to disabling the internet features of a motherboard for certain times of the day to restrict access for younger users. There are several easy ways for those users to disable it however - either by changing the system clock, or by going into the BIOS and changing it manually. There is also the possibility that using a WiFi dongle would get around this, as the BIOS can only control the network port on the motherboard. The main section of the BIOS is in the OC Tweaker menu, which deals with overclocking. For automatic overclocks, we have the Advanced Turbo 30 option that gives a 4.7 GHz overclock on the system, and CPU OC/GPU OC settings that give predefined values for each value to reach desired overclocks. These will be tested in the next page of the review. The rest of the OC Tweaker menu is standard. CPU Ratio can be selected per core or for all cores, and BCLK can be adjusted appropriately. Adjusting the BCLK also directly affects the value chosen for the memory strap, which is always good to see. Power limits and turbo boost options are also here. Memory settings are found under the CPU settings, and voltage settings are underneath that. 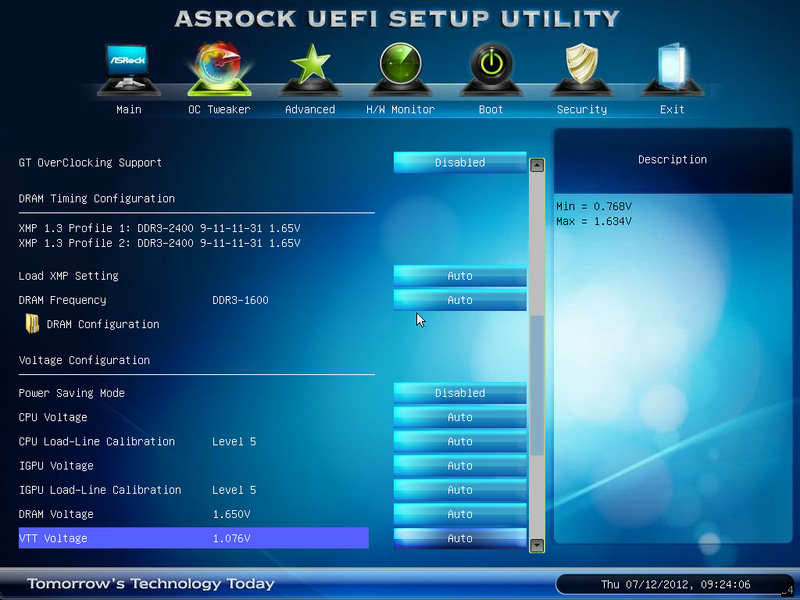 Thankfully, ASRock are nice and thorough on describing each of the features, especially the Load Line Calibration - sometimes it is never clear if LLC Level 1 or Level 5/10 is the optimal setting for constant voltage, but ASRock provide a handy diagram for users. Three profiles can also be saved. By default, ACHI is enabled (a good setting), and the onboard Floppy port is disabled. Users can enable the Floppy port by going to Advanced -> Super IO Configuration as shown below. In order to update the BIOS, ASRock have an option to flash from a USB stick whilst in the BIOS (nothing new there), but also a novel feature called Internet Flash. Part of their BIOS code contains networking protocols such that users who have a non-login wired internet connection can directly probe ASRock's servers and download the latest BIOS. My testbed setup uses an esoteric combination of WiFi and ICS, and thus this was not applicable in my usage scenario. 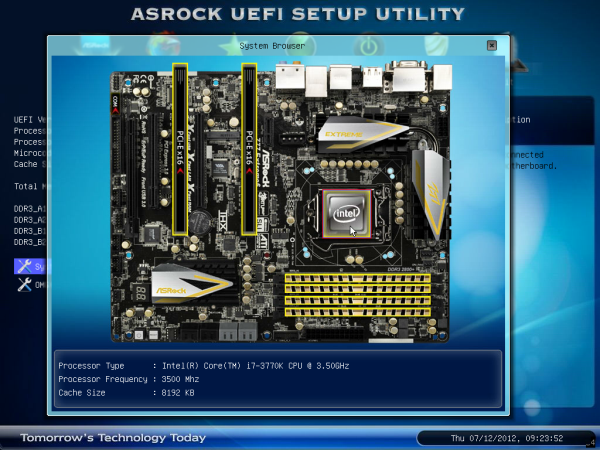 However, it is a great feature to have in a BIOS, and I fully expect other motherboard manufacturers to copy this. 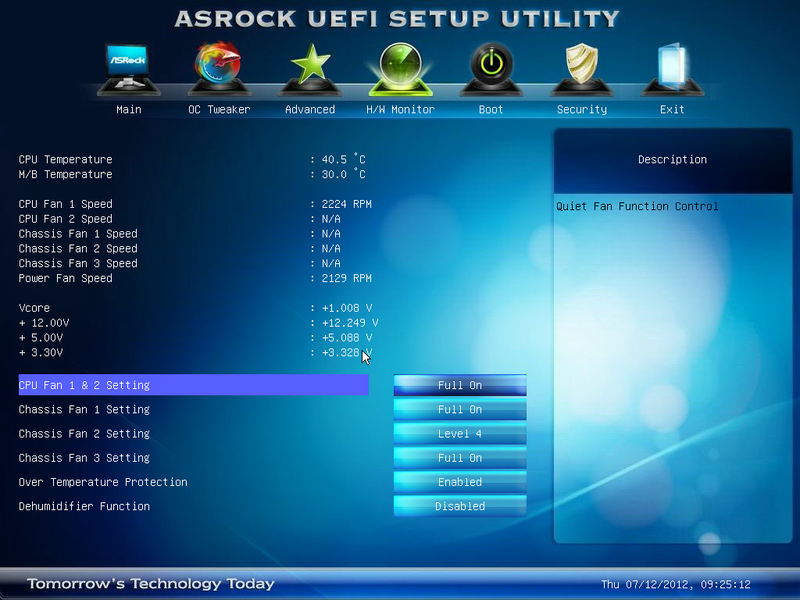 Fan controls from ASRock have been in the past a little confusing and disappointing in the past. While some of ASRock's competition allow users to specify a gradient between minimum and maximum RPM of a fan on a header, ASRock relies on using 'Target Temperatures' and 'Target Speeds', which use various levels to describe the ferocity of the fan. This is not an ideal situation if it requires users to try to understand how it works. The interface should be clean and easily selectable. You have a PC in a very humid climate, where humidity is in the high 90%. When you use the PC for gaming, the temperature inside the case rises. As air gets warmer, it can hold more water. Therefore, if we have (for example) 4 grams of water in a case at 40ºC, the specific humidity of that air is greater than a situation where we have 4g of water in a case at 60ºC. But at 60ºC, the air can hold more water (say 6g). When the PC is turned off, or the localized air gets cooler, the air inside the case can get cooler, and when the air reaches 100% specific humidity, the water vapor leaves the air and condenses on components. ASRock's Dehumidifier function makes the PC spin up the fans for a periods of time during the day to remove the hot air that has accumulated during the day from the case, and replace it with cooler air, but at the same time the hot air takes away the extra water vapor with it. It can get confusing as well if you consider where the extra water vapor would come from. Scientifically, it deals with the balancing of specific humidity across two adjacent temperature zones. Using arbitrary numbers, consider two pockets of air close to each other. Each holding 2g of water vapor (so 4g total), but the first pocket of air (A) is at 40ºC, with a specific humidity of 100%. The second pocket of air (B) is at 80ºC, with a specific humidity of 50%. The water vapor will migrate from A to B, in order to balance the specific humidity. This would mean that in the end, A would still be 40ºC (assuming no heat transfer), but hold 1g of water with a specific humidity of 75%, and B would still be 80ºC, but hold 3g of water with a specific humidity of 75%. If suddenly the temperature of B dropped to 40ºC, then 1g of water would condense out of the air, leaving it with 2g of water (specific humidity of 100%). 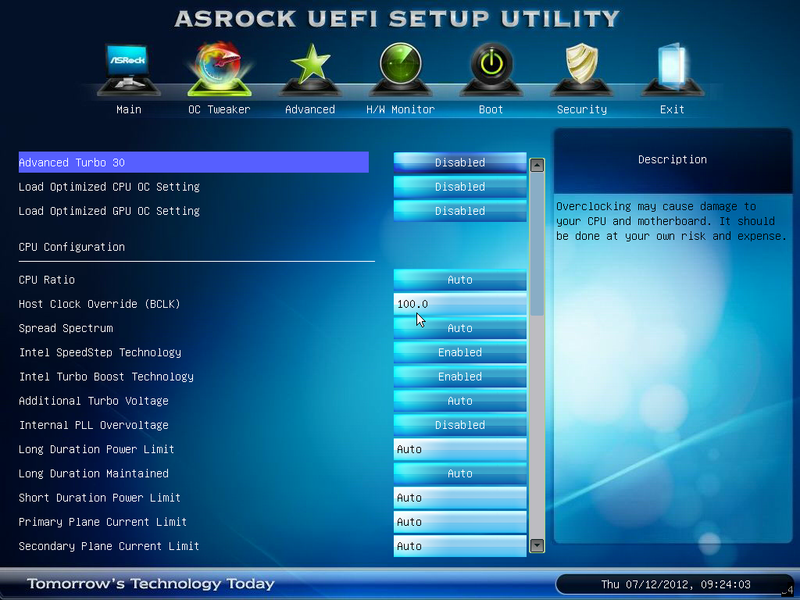 This is the scenario ASRock are hoping to avoid with the 'Dehumidifier' function. Perhaps 'Dehumidifier' is the wrong thing to call it, but it is there if this is your scenario. ASRock love to include licensed software in their motherboard bundles. Their main marketing feature is the '555 XFast' motif, covering XFast LAN (licensed software), XFast USB (licensed software), and XFast RAM. Each of these will be covered in turn. 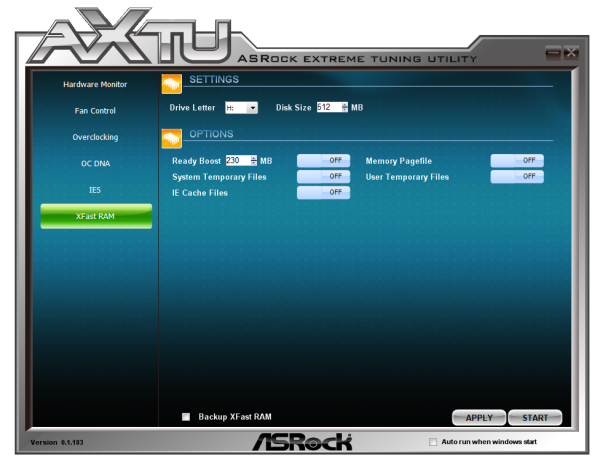 But first, let us start with the ASRock eXtreme Tuning Utility, or AXTU. Options include the hardware monitor, fan controls, overclocking, OC DNA (for sharing BIOSes), IES (Intelligent Energy Saver), and XFast RAM. The hardware monitor is as you see above - we have access to a lot of data for the CPU, voltages, temperatures, and fan speeds. A lot of this would be a good inclusion on the first BIOS page (hint hint). The fan control settings are easier to manipulate than those in the BIOS, however there is scope to improve the visual aspects of this interface with graphs and so on. Overclocking options on the other hand are a little tame, giving no direct control for inputting values - everything is done on the sliders. The voltages are a little confusing, as it shows neither the current values set by the BIOS nor the current values as per the CPU load. Giving users only an offset voltage to play with is a little frustrating. The Intelligent Energy Saver function attempts to reduce the voltage on the CPU as well as the number of power phases in use at any one time. 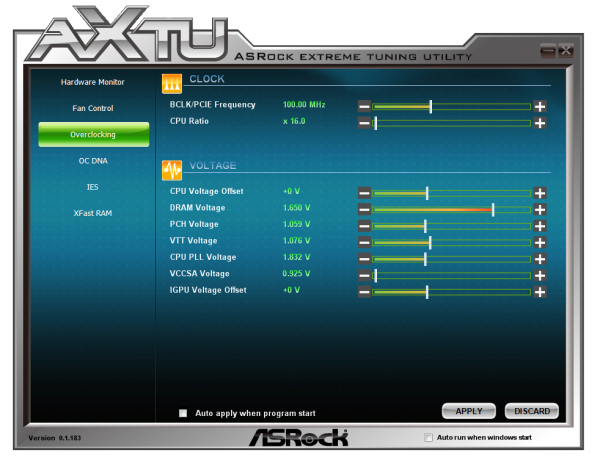 XFast RAM is a feature ASRock are using to help speed up certain features of the motherboard. ASRock recognize that users of Z77 motherboards can pick up memory very cheaply, so it would be common enough to see 16 GB of memory in a system. Even as an enthusiast, I have only ever seen my 16 GB system hit 8 GB a single time and that whilst playing a game and having 100s of internet tabs open at once. Thus ASRock have said that it would be worthwhile donating part of that memory into a RAMDisk, which acts as a fast store for temporary files. Users can thus partition off part of their memory to deal with temporary cache files as required. Reading from the memory is a couple of orders of magnitude quicker than the solid state drive, in terms of both latency and throughput, which means the system should be sped up quite effectively when loading temporary files. 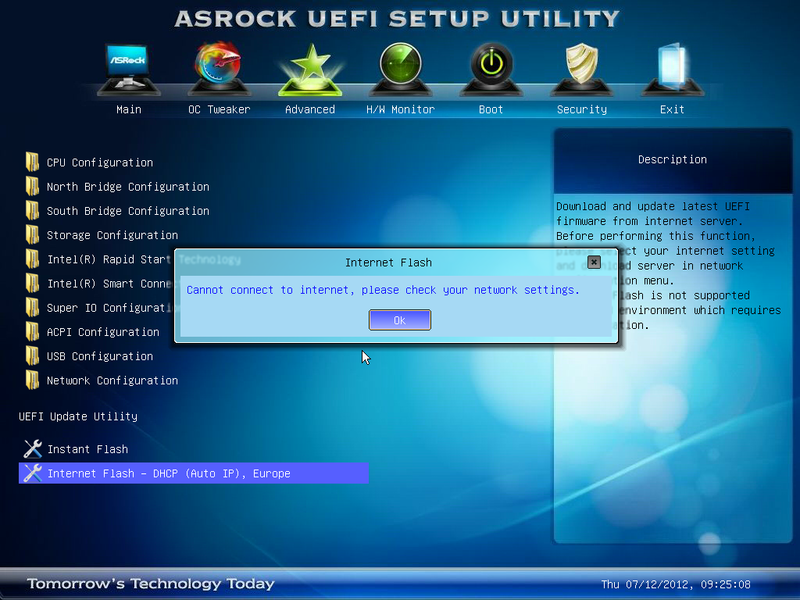 Licensed from cFosSpeed (in much the same way that ASUS' ROG GameFirst software is), ASRock have included a software driven networking utility as part of their software bundle. This utility allows users to decide what has priority over the networking protocol. Should a gamer ever decide that he or she needs to heavily download while playing online games, this can be managed here. On the other hand, perhaps VoIP needs priority, or media streaming tools. XFast LAN also allows for port management of the network, as well as traffic analysis and monitoring. One feature that is crying out for Windows 8 is the overhaul of USB protocols. When Windows 7 had first come out, USB 3.0 was still in its infancy, and the standard set of USB commands were available. This is still true today with Intel's standard chipset drivers. One way of increasing USB throughput is to disregard latency, using Bulk Only Transfers (BOT). 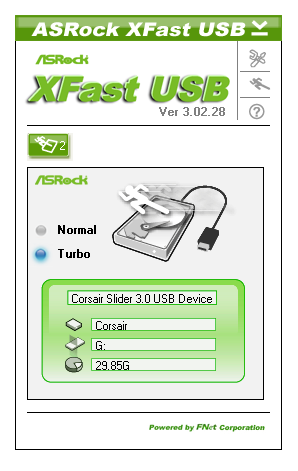 This is what XFast USB does - it overrides the USB driver in order to use its own commands. 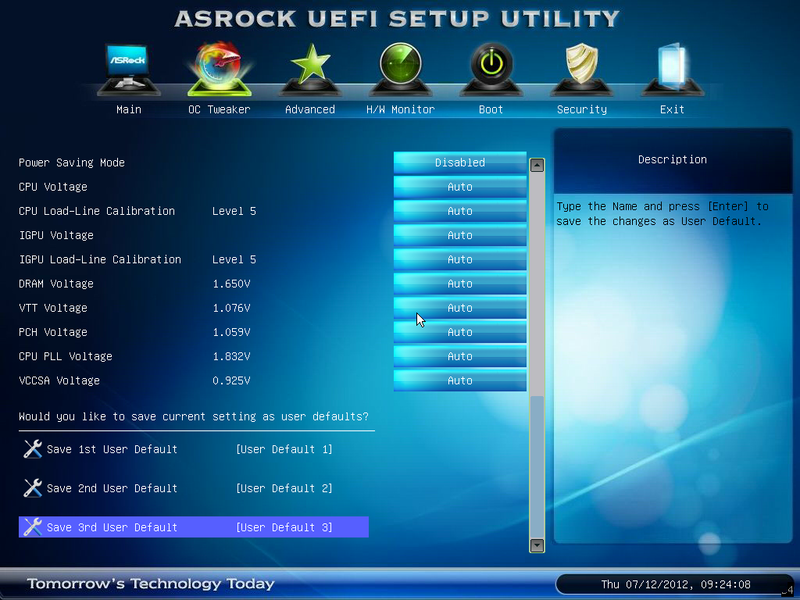 The stage above BOT is UASP, which will feature by default in Windows 8 with appropriate hardware. 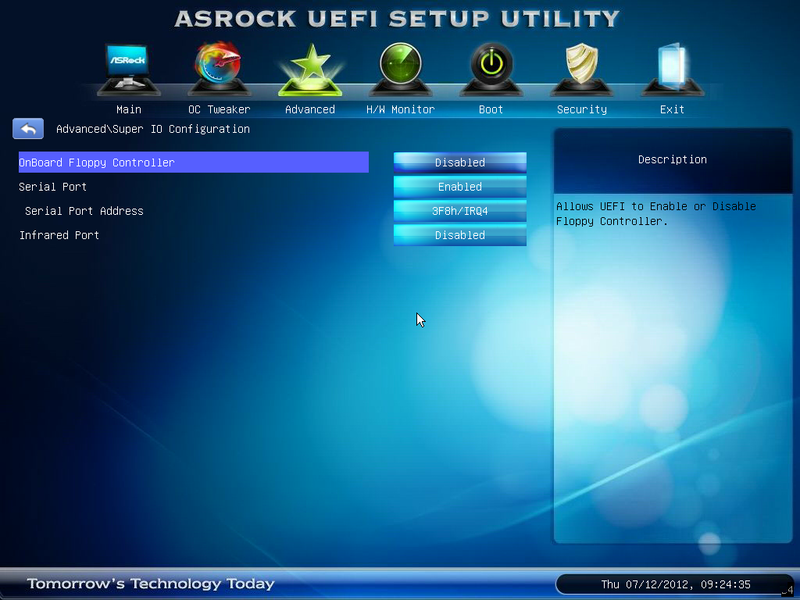 But for now, ASRock are giving XFast USB on a port-by-port basis, working on both USB 2.0 and USB 3.0 for a single device at a time. In our testing, it definitely speeds up the peak transfer rate, saving 20% time on our USB transfer test. Agreed, I still need to use floppy disks at work and it's no problem with new machines as a USB floppy disk drive appears to work as well as an internal drive as I've had no issues with it. Even then I don't really get this board, I could certainly see making a legacy Z77 board with a couple of serial ports, PS/2 ports, PCI and IDE ports with the rest of the board very basic would be handy for legacy enterprise use but this board is nothing like that, it seems a fairly fancy motherboard with a floppy connector strangely added. Agree have not used a floppy for at least 5 years, and have not build one in my PCs for even longer, still have a USB floppy, that i used literly just once, and properly never again. Just built my new gaming rig using this board which I picked up from the Egg for less than $160. I am happy with the board layout as it was easy to connect all my devices. The BIOS was super easy to navigate and understand and my internet BIOS update worked which was pretty cool being able to update BIOS like that. The build has only been running about 2 weeks and I am just running everything stock now making sure all components are stable. In another week or two I will try out overclocking. I did have problems with the board recognizing my RAM. I put 16GB of cheap Team Xtreem Dark Series 8GB (2 x 4GB) 240-Pin DDR3 SDRAM DDR3 1600 in the board and it kept thinking it was 1333. I had to go in and force the board to think the RAM was 1600. "I did have problems with the board recognizing my RAM. I put 16GB of cheap Team Xtreem Dark Series 8GB (2 x 4GB) 240-Pin DDR3 SDRAM DDR3 1600 in the board and it kept thinking it was 1333. I had to go in and force the board to think the RAM was 1600." Dude, that's not a problem, that's exactly the way memory is supposed to work. The JEDEC standards call for 1333 as a/the default setting when first installing memory so it'll work in any motherboard, regardless of rated speed. After reading this review I am now a little bummed about the middle/lower performance of this board compared to its competitors. In all reality such a small difference in performance though is not my primary concern. I think I will see much more real world benefit from the XFast USB included with this board as it seems to make a substantial impact and I do quite a lot of USB transfers (pictures, video, files). I still wouldn't pass over the OCZ SSD as a problem. Both of mine eventually failed causing BSOD's. My Agility II didn't even last two weeks before disappearing into never-ever-land, never detected again, that is.